In the pressroom at our news office sits the press with the last issue (Aug. 1, 2018) that will ever be printed in house as the printing side of our business goes "dark." Change came upon us and I am excited to say we survived the initial immediate blow!! Time seems to move along at a pace that sometimes is hard to keep up with and we have the option to renew and reenergize or pass and ponder the if’s. The same is said for business. We must be able to provide a product twice a week that is viable to us and our community. We could not do that without our subscribers / readers and advertisers that we partner with. In the news business it always has a double edge sword of good news and bad news, and information that can make us happy, sad, angry, informed and still undecided. In many cases we simply report on the dialogue at a meeting in local, county or state government and hope this allows our readers to become more informed and aware of the local dealings that affect them. This in turn provides them the information to be able to ask the questions that they need for themselves to be an active member of a community and be allowed to use their voice. In the reporting of events and activities in our community it can give you a bird’s eye view of the event and how it impacted us in entertainment and involvements. I am proud to say that I have a staff of eight that are part of either production or out there in the community reporting the news and events or visiting our advertisers to provide our readers the news and advertising options that we are all looking for. Their dedication to the job and in this the case the change of procedure was made easier by their "can do" attitude and our decision to be proactive vs. reactive. I have been at the Mountain Home News for 27 years and have seen change come our way with change of procedure, policy, software, hardware, equipment that sometimes was very quick and others at a slower pace of planning. I myself am more of a planner, but we do not always have that privilege and must make hard decisions quickly that affect us as a business looking for the option that enables us as a business and that benefits our advertisers and reader. That all happened August 2, 2018, with no warning, but I am proud to say we accomplished the last two weeks with no hiccups to speak of and put are products on the street. Due to a computer hardware issue in production Thursday that made it impossible to print the papers here I had to scramble to outsource the printing of the Patriot that day and have continued with since it was immediate and unfortunately, in this case, permanent. 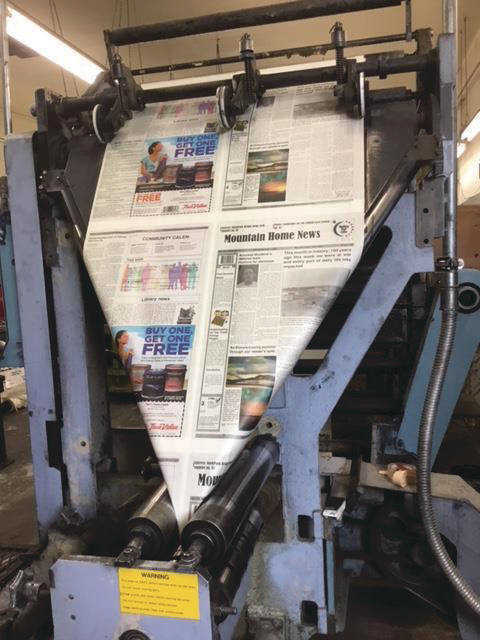 Our last full print production of the Mountain Home News was August 1, 2018, and it still sits on the press. Sometimes the aquisition of software and hardware for aged equipment is either impossible or very expensive; and you must review the options and go for it! The decision to have the pressroom “go dark” and the printing production of our publications outsourced was hard at the very least. We are at the same time excited to announce the availability of new and more advanced technology and equipment by our printing partner to provide us new opportunities and the ability to expand not only our knowledge, but what we can provide to our advertisers and readers. With that being said the Mountain Home News pressroom has “gone dark” and ceased all printing production here locally. This paper has a rich history of being produced here for many years that involved family owned production by the Waters family for one, and since I have been here corporately owned. We are the oldest and official publication of Elmore County and in existence since 1888. We are indeed still a family of employees that live and work in our community, that are here because we want to be and because we believe in what we do. It affected the business, but for me it also had a more personal note. I run a business that can and does affect the eight that work for me, but it was the end of a career for my husband Larry Fincher. Larry started here in July of 1995 and had never seen a press much less run one. He learned it from the ground up with the encouragement of then publisher Coleen Swenson and he never looked back. 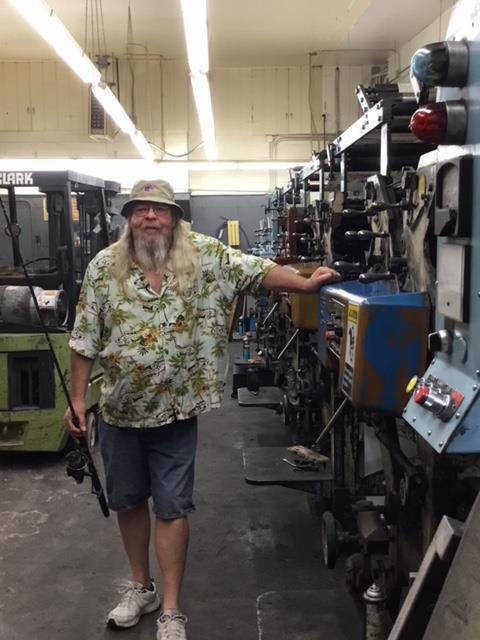 His 23 years as a pressman had come with many new friendships of other pressman that encouraged and assisted him in the learning of his trade as well as our vendors in the business. The comment he made this last week prior that will forever be etched in my heart is when he said “I can’t believe I will never push the button again” referring to his biweekly startup of his press and the production of the papers. We all at that moment realized for the Mountain Home News we had come to the end of an era. The art of being an old school pressman that produced the way we did had come to an end. Advancements in technologies and equipment were always something he looked at in awe and wished he had some of the mechanics available to him, but at the same time he was part of an art and talent that was self taught and something to be proud of. He has indicated that he sees some fishing in his immediate future to finish up the summer and to decide what he would like to do in as far as working or not or the glorious decision of retirement. It simply snuck up a little faster than planned. Sometimes you just earn that privilege and with all things come change. I hope you noticed the change last week or simply “pondered” something was different. We appreciate all the positive comments that have come our way by readers that did not know the circumstances of the change, but did reach out to us. We are doing some digging to be able to share some of the history of the Mountain Home News in our birthday and history story coming up shortly. It was something already in the works, just will have a bit of a different ending with our latest changes. We will continue to celebrate life, news, events and community the way we have but new and changing looks are still in the forecast. Stay tuned and Thank You Mountain Home for your support and partnerships in providing what is important and what matters in our community. Last and most definitely not least is the staff of the Mountain Home News and Patriot. You have taken the curve ball thrown at you like the all stars I know you are, stepped up to the plate and smacked it out of the park. Not one of you balked or hesitated when we had to regroup as a team and produce our papers. I cannot thank you enough for the dedication and effort put into this change and your continued dedication for our readers, community and advertisers. You are the best. Here is to change and all the positive outlook and possibilities. Have a great week, B.